I have successfully planned our meals for the last 2 weeks. Woohoo. I am on a roll. It makes life so much easier when I don't have to think about what I need to cook for dinner. I have been making some meals on Sunday so that we have food for lunch and good snacks to eat during the week. I have also been making dinners ahead of time to cover the nights we have Tae Kwon Do. It is definitely more work, but it is worth it to have healthy food to eat. I made all of the recipes above this weekend. I can tell you they are all winners. 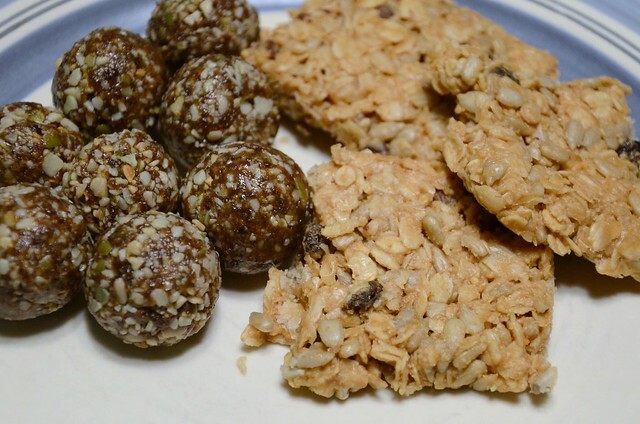 The kids love the raisin seed balls and the sunflower oat bars. I used peanut butter for the oat bars. The breakfast bread is also very yummy and also almost gone. The sunflower and cashew cheese is great on crackers or could work in a wrap with veggies for lunch too. I made all of these except the burritos this weekend too. The sweet potato hummus might be my favorite. It is really, really good. I also have some chicken and tofu that will get thrown into the mix too for the kids. Harper refuses to eat fish. She was traumatized back in August when we went trout fishing. We ate the Lettuce Wraps Sunday night for dinner and the kids loved them. So needless to say there has been no sewing going on at my house. I did manage to cut out and interface some fabric for a purse. I also have a baby quilt to make. So I promise there will be crafty things to show soon. I so need to do a better job of dinner meal planning, too. I do fine on the lunchbox part of it - but come 2:30 and I'm standing there wondering what to make for dinner....grrr...least fave thing in the world. I'm going to do a better job of this. dinner is the the Uck in my life story. I need to plan, but I can't seem to get my act together.